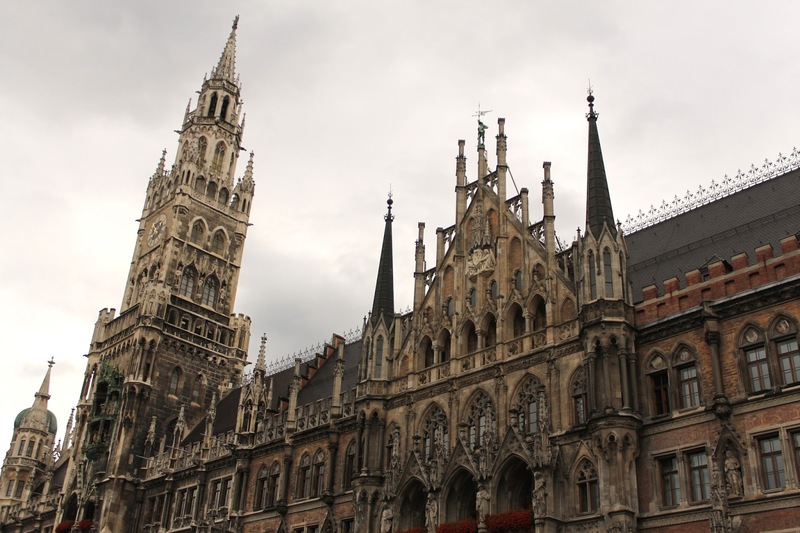 Once we dropped our luggage off at the Novotel Munich City Hotel,* we wanted to fully immerse ourselves in Munich/German ambience, so we headed straight for the Marienplatz, which is Munich's central square. We wandered around there for a bit, but eventually the crowds pushed us toward the Hofbrauhaus. The gorgeous Marienplatz offers visitors a uniquely German flair. Had we had more time on this day, I would have elbowed my way into a table (particularly in the lovely beer garden) and we would have spent more time in this famous beer hall, but instead we just walked through and took it all in for only a few moments. Yes, its touristy, but it has such a fun atmosphere. And while we hit several beer gardens the next day, the Hofbrauhaus had a vibe all its own. Finally, we ventured through the Viktualienmarkt. This is the large market in the city, selling all kinds of amazing products, food and otherwise. While crowded, it never felt claustrophobic, and we strolled around at a really nice pace. Naturally we ended the day with ice cream. And smiles. Tips: Time your walk around the Marienplatz for when the Glockenspiel rings (11 a.m., noon and 5 p.m. in the summer, 11 a.m. year-round, so I'm told). And time your visit to the market to coordinate with a meal time. I would have loved to create a picnic with the cheese, meats, bread, and produce found in the market, but we weren't hungry when we walked through. It's a short 5 minute walk between the two places. This was my favorite day, and I plan to write a more thorough blog post about it next week. We rented bikes from Mike's Bikes and pedaled around the city from morning straight through until bedtime. Along the way, we saw the opera house, the Residenz, the Olympic Park, and the English Gardens (where we went on the most family-friendly beer garden pub crawl you could possibly imagine). Like I said, more to come, but if you're planning a trip to Munich, renting bikes is a MUST if you have nice weather. 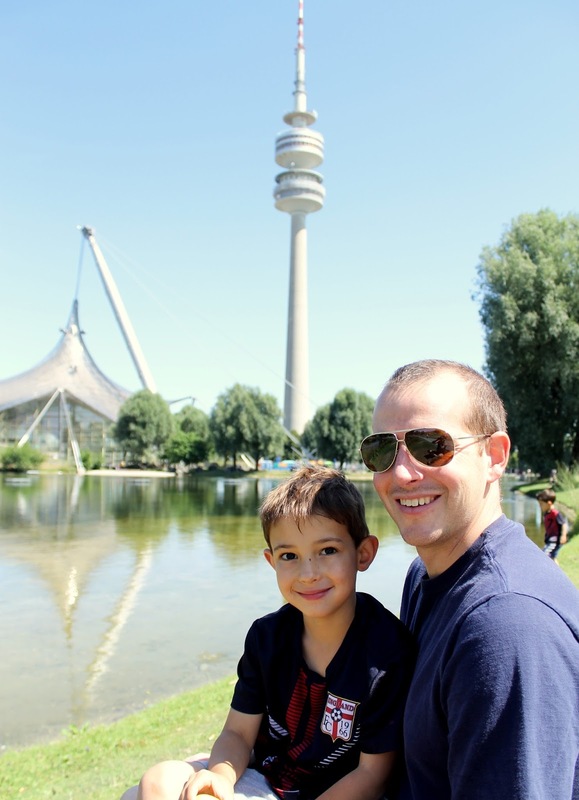 Catching some sunshine and resting our biking legs in Munich's Olympic Park. We only had the morning on our last day in Munich, but the activity I planned could have easily filled an entire day. My only regret of our time in Munich is that we didn't get to spend more time at the Deutsches Museum, the world's largest science museum. We arrived just as it opened and immediately began exploring an endless maze of hands-on activities. It took two arrows to figure out the complex water table in the Deutches Museum. Tip: We went straight to the Kid's Kingdom in the basement of the building, but we didn't need to do that. 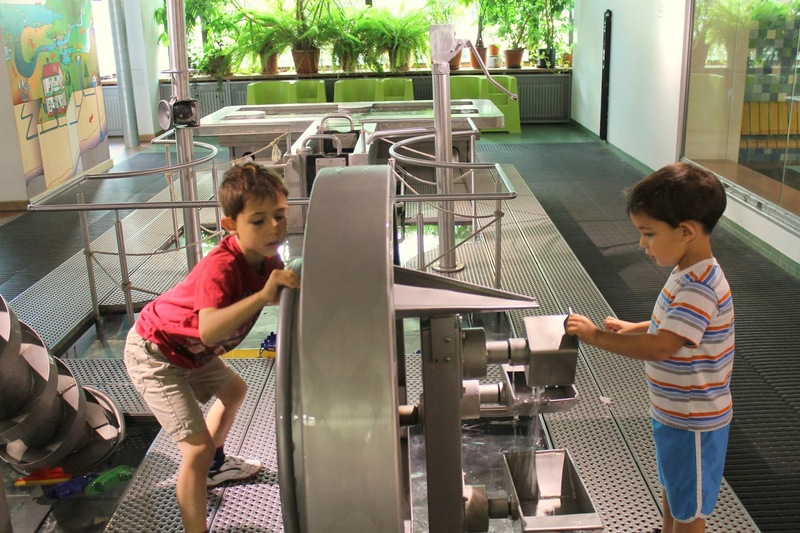 There are activities for children throughout the entire museum. In hindsight, I would have hit a few key exhibits in the main part of the museum in the morning when energy levels and attention spans were at their best, followed by lunch, and then spent the afternoon in the basement. Also, I found the food very expensive, but admission for a family of four into the museum is only 17 euros which is insanely reasonable for a museum of this size and quality. 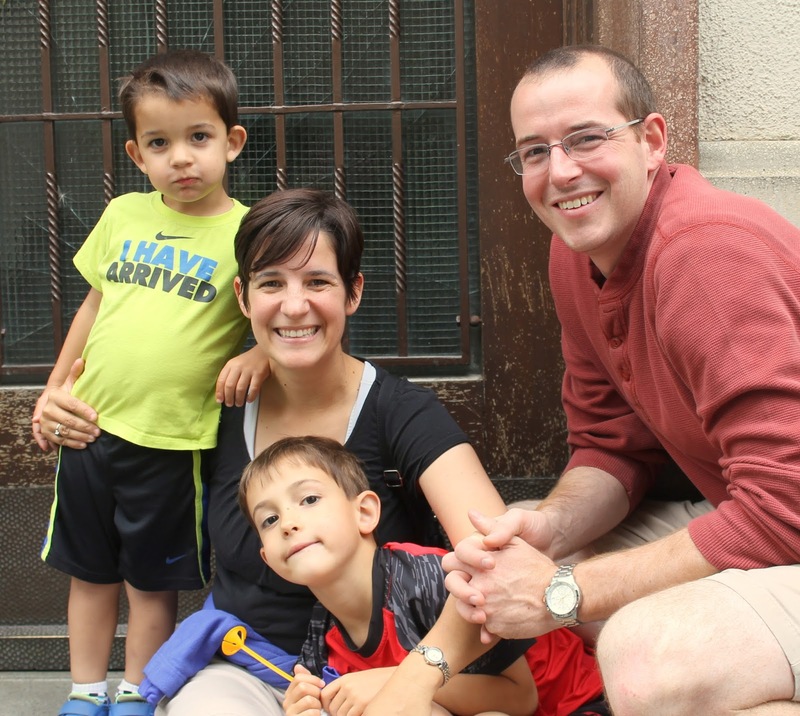 Rarely can a city vacation in Europe with two young children be considered relaxing. Yet our time in Munich truly was. 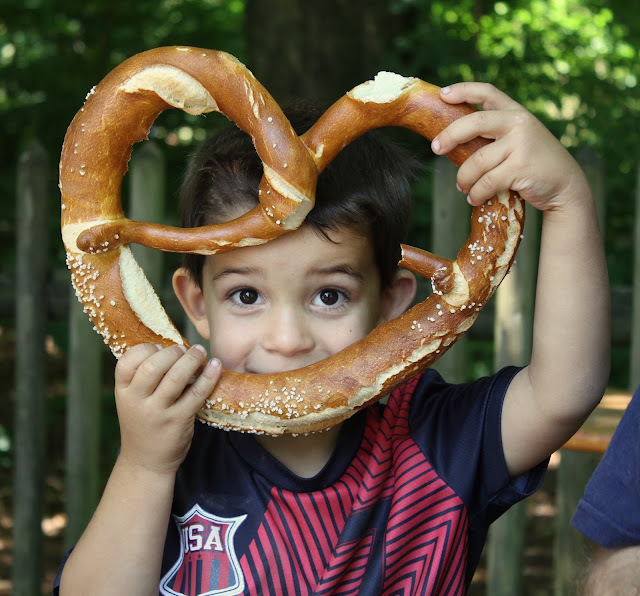 As much as I hate to admit that my husband was totally right about Germany, I'm sure glad he was.